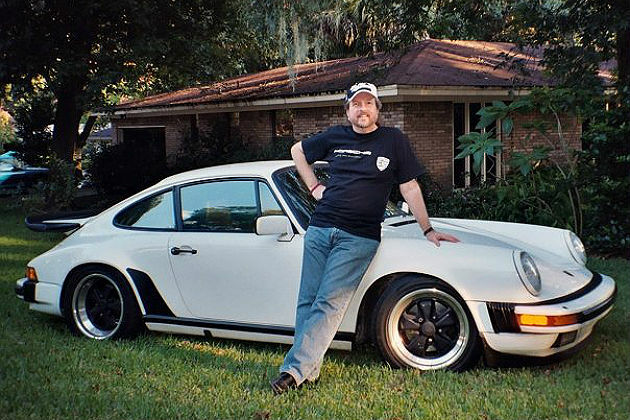 Bruce Floyd leaning against his 1985 Porsche 911 Carrera. It's finally happened. I always knew it probably would, but I was hopeful we could put it off as long as possible. You see, I have always been the lucky recipient of all my husband Bruce's attention. I was absolutely first in his heart — at the forefront of all his thoughts. It may sound trite, but we have always preferred each other's company to that of anyone else's. We're best friends, have always enjoyed the same things and really had an awesome relationship. In the span of 24 hours, everything changed. She came along — rolling right into his heart with her curvy, little wide body. It's tough enough when your husband's head is so abruptly turned, especially when she's not even 30 years old! And straight from another man, no less. Shameful. He actually had the audacity to bring her home. And, to really twist the knife, he kindly shared with me that she's the one he's dreamed of his entire life. Have you ever heard of the lovely movie star Portia di Rossi? Well, this one's name is Porsche Carrera. And let's not forget her measurements: 911. There's a good reason why 911 is in her name — she's an emergency waiting to happen, especially when she's going full speed, all out on an entrance ramp. Another of her physical characteristics he likes is her backside, of course. It's even got its own name: Whaletail. And he's smitten with it. One of the things that we have always enjoyed doing together is traveling. So, in the midst of planning our next trip (and thanking my lucky stars that she's too expensive to bring along), he informs me that since we're going to Europe, and we're going to be so close to Germany, he simply must visit her birthplace in Stuttgart. Let's examine this for a moment — I was born in Gainesville, Florida, about an hour and a half from where we live. He has certainly never expressed an interest in seeing the hospital where I was born. Nooooo, but we can traipse all the way to Europe to see where she got her start in life. You know, I always knew where my husband was most of the time. Now? Whenever I look for him, he's nowhere in the house. Where is he? In the garage, staring at her like a lovesick puppy dog. Is he drooling? I remember when he used to stare at me like that. And not only that, it used to be my sweet little Mustang that got the premium garage space. Now she's been kicked into the elements so that Mistress Porsche can have the garage. Not fair. He even goes to meetings now. Like AA, only no one tries to stop the addiction. Rather, they fuel it. Like he needs any encouragement. I have to admit. She is a sweet little thing. Maybe we'll even make friends. But I'll tell you this: I am not getting a whaletail for anybody. Mine is just fine as it is, and my husband will have to make do with it. Vicki Floyd is a freelance writer, blogger and classically trained musician. She lives with husband, Bruce, in Jacksonville, Florida. They enjoy traveling and spending time with their children and grandchildren because car seats do fit in Porsches.